Last Friday, I went to a Masterclass of Management of arm spasticity organized by Professor Paul Mc Arthur hand plastic surgeon and Ms Jane McPhail, consultant maxillo-facial prosthetist. It amazed me how much I always learn from colleagues from other specialties.. We all learn the same functional anatomy of a given muscle, so what’s make the view so different between a neurologist, treating a writer’s cramp and a hand surgeon treating a spastic arm? Spasticity and dystonia have a different origin. Spasticity in adults commonly followed a stroke with lesion of the cortex (the skin of the orange!). Writer’s cramp is a focal dystonia, which is due to a circuit problem between the deep nuclei (Basal ganglia-the seeds of the orange!) of the brain. Oppenheim, 100 years ago defined the word dystonia as an increased tone different from what was seen after stroke. The difficulties encountered by these patients are very different. Dystonic patients such as Writer’s Cramp have problems when writing, but otherwise are fine for other tasks and at rest. Patient with spastic arms have a permanent disability at rest with pain, discomfort and abnormal posture, interfering with every action requesting skills and strength. The abnormal posture has nothing in common…the spastic arm present with rigid flexion of the elbow, arm in pronation (palm of the hand twisted and looking to the floor), and flexion of the wrist and fingers . In case of a dystonic arm, the abnormal posture is not fixed and will be present only when writing. Sometimes the dystonia is more severe and the arm has a mobile, variable abnormal dystonic posture when arm outstretched and when walking; the whole arm is twisted in pronation but without a fixed flexion of the elbow, the wrist in flexion and the fingers can be flexed or extended, animated with slow movements. Spastic arm: I learned from professor McArthur the concept of function unit to understand at best the spastic arm, with the biceps, brachialis and brachioradialis for the arm flexion, the pronator teres and the flexor carpi radialis for the arm flexion and pronation, and the synergy between the lumbricals and the flexor digitorum communis . Also I had the demonstration that ultra sound can be crucial to target the spastic muscles precisely as the arm is permanently in an abnormal posture, modifying normal anatomical reference. The electromyogram is not helpful, except the stimulation, as the voluntary command of the arm is poor. 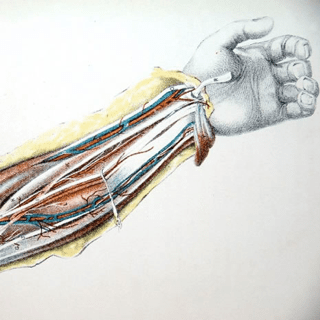 Dystonic arm: My experience of watching and treating dystonic patients taught me, on the other hand, that dystonic arm requires to be assessed during the task which triggered the dystonia, that 1 or 2 muscles in spasms can lead the all arm in a dystonic spasms, and that electromyogram is extremely helpful to document the dystonic bursts in the arm; the selection of the muscles is complex as the posturing is variable , but targeting the muscle itself under e;ectromypogram is not as difficult. Confronting experience and developing concepts between clinicians from different specialties, are invaluable, and the Liverpool course confirmed that looking from another perspective brings new ideas. 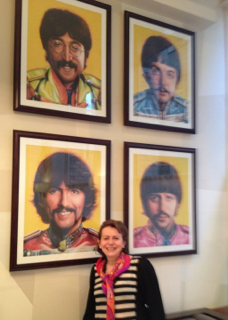 Also spending a night in Liverpool at the Hard Days Night hotel, having breakfast surrounded by the Beatle’s portraits make you feel very far from London.